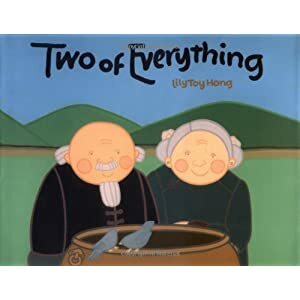 Have you ever read Two of Everything by Lili Toy Hong? It is a Chinese folktale about a little old woman and a little old man who find a magic pot that doubles anything you put inside - including the little old man and woman! And it is a terrific resource for teaching the doubles strategy in math. Whatever goes in the pot gets doubled when it comes out! and we pulled out double! I found these cute little 'cauldrons' after Halloween last year and snapped up a handful of them - they were perfect for this!